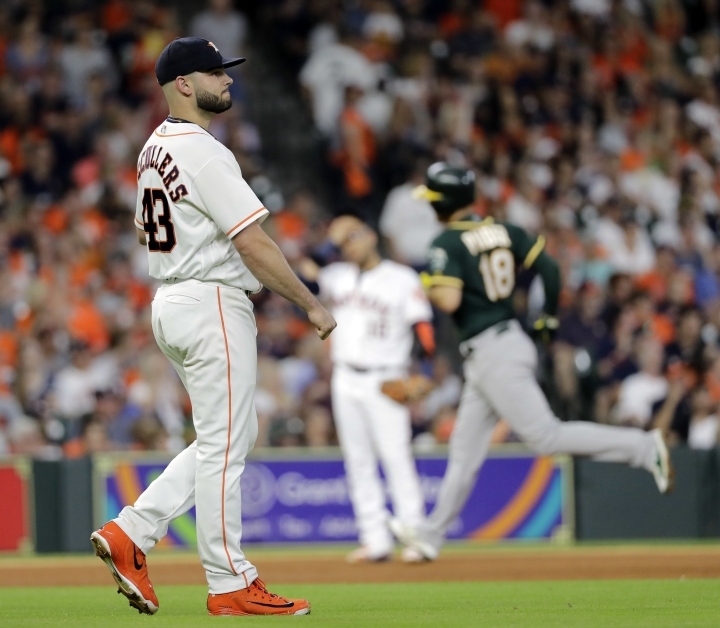 HOUSTON — After making a habit of late comebacks this season, the Oakland Athletics enjoyed building an early lead and holding onto it. 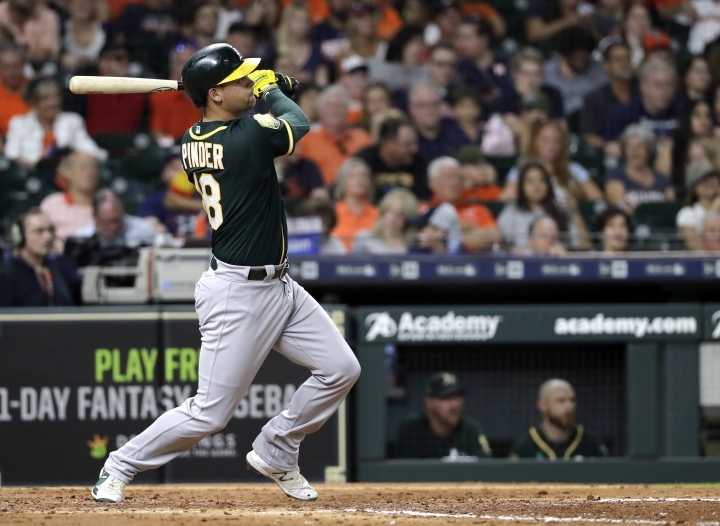 Chad Pinder hit a three-run homer and Khris Davis added three RBIs as the A's jumped on Lance McCullers Jr. early and cruised to an 8-3 victory over the Houston Astros on Wednesday night. 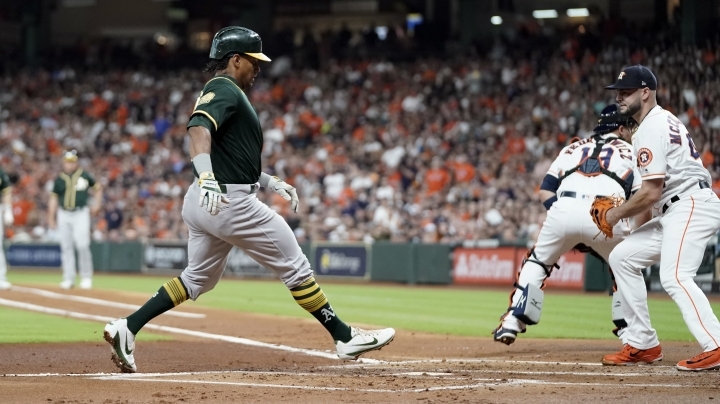 The A's lead the majors with 67 runs in the eighth inning or later and entering the game they'd scored the winning run in the eighth or later in nine of their last 21 wins. "Not always coming back from behind and just winning a ballgame when we were ahead. We can do that, too," Davis said with a smile. 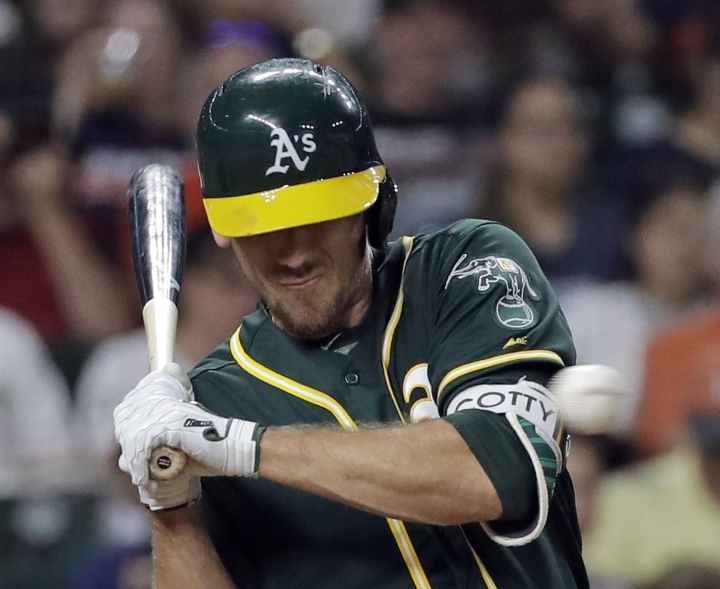 Oakland manager Bob Melvin said this was a much-needed win after his team rallied from a 4-0 deficit to tie it in the ninth on Tuesday night before losing 6-5 on a bizarre play in the 11th inning. "It shows you the grit these guys have," he said. "That's a demoralizing loss to be able to come back as far as we did last night and get beat in the fashion that we did. ... To be able to jump on their starting pitching right away showed me a lot from these guys to just move past what happened (Tuesday)." 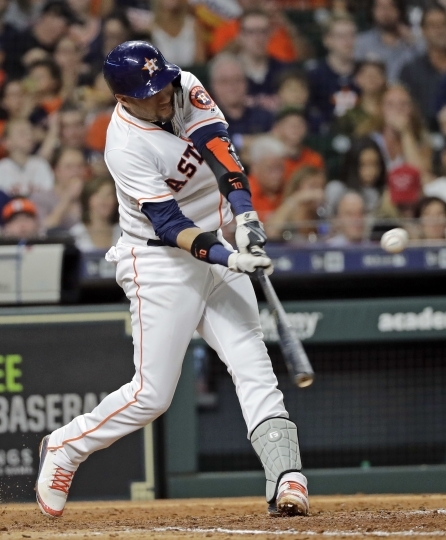 Yuli Gurriel drove in two runs for Houston, and Tyler White hit a solo homer that cut the deficit to 6-3 in the fifth. McCullers allowed four hits and six runs while walking five in four-plus innings for his first loss since May 26. It came after a stellar outing last time out, when he whiffed a career-high 12 while permitting just three hits and a run in seven innings of an 11-4 win over the White Sox. "You could just tell he was battling himself," manager AJ Hinch said. "He just didn't have it. ... So, little bit of mechanics, a little bit of approach but more of it just he just couldn't throw the ball where he wanted to." Things went wrong for McCullers quickly when he walked two batters with one out in the first. 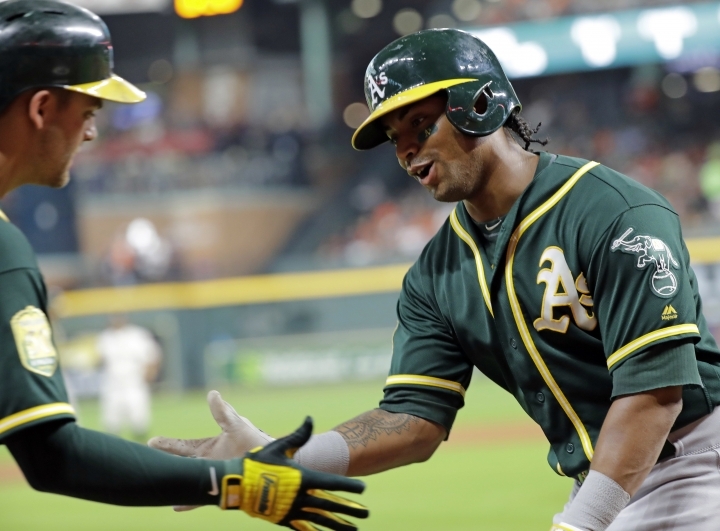 The A's took a 2-0 lead when both runners scored on the double by Davis. A single by Stephen Piscotty sent Davis to third and he scored on a sacrifice fly by Matt Chapman. McCullers plunked Chapman to start the fourth before walking Mark Canha. Oakland pushed the lead to 6-0 on the homer by Pinder to left field. Bassitt retired nine of the first 10 batters he faced, and the Astros didn't get a hit until Alex Bregman's single with nobody out in the fourth. Jose Altuve singled before Gurriel's two-run single cut the margin to 6-2. Emilio Pagan worked two scoreless innings after Bassitt's exit. Marcus Semien doubled with one out in the sixth and scored on a two-out triple by Davis to push the lead to 7-3. Oakland made it 8-3 on an RBI single by Josh Phegley in the ninth. Astros: INF Marwin Gonzalez sat out after taking a cleat to the left wrist Tuesday night. He is day-to-day. ... SS Carlos Correa (back stiffness) ramped up his activity and said he's feeling good and believes he is inching closer to a return. Athletics: Piscotty exited in the middle of the fifth inning after being hit by a pitch on the left wrist in the top of the inning. The team said his wrist was bruised and Melvin said X-rays were negative. Houston optioned reliever Ken Giles to Triple-A Fresno, a night after he appeared to curse at Hinch when he was lifted from the game. Despite that, the Astros insisted the move was about baseball and not the right-hander's behavior. "We need to get his pitching right," Hinch said. "He's had an up-and-down season. He's had signs that things are good. He's had some bad games. He's had some meltdowns. But we need to get him right. He's not right and we've got to get him right mentally and physically to make sure he's a good contributor to a 'pen." Left-hander Cionel Perez was recalled from Double-A Corpus Christi to take Giles' roster spot and allowed two hits and a run over 1 2/3 innings in his major league debut. Bregman was named to the Home Run Derby field on Wednesday night. He will be the fifth Astros player to compete in the contest, joining Lance Berkman and Jeff Bagwell, who made four appearances each, Moises Alou and Glenn Davis. "I've watched it a bunch," Bregman said. "I don't know if I've ever dreamed about being in it but definitely looking forward to it." Oakland RHP Trevor Cahill (1-2, 2.77 ERA) will come off the disabled list to start against Charlie Morton (11-2, 2.83) in the series finale Thursday. Cahill has struggled on the road this season, going 0-2 with a 5.66 ERA. Morton has won four of his last five starts.